UPDATE 03/09/2008: The voting results are in. Please welcome new/re-elected board members Arnie Press (VP), Paul Rossman (Communications), Jeff Oberg (Events Coordinator), Chris Michalek (Treasurer), and Steve Rosenblum (President) who will be joining the existing Board Member at Large Francis Macasieb. Thanks to Paul Lark and Blake Mayerle for participating, and presenting a well run campaign. I also wanted to take a moment and thank outgoing board members Lori Wright, Matt Adams, and Gabe Bridger. Matt and Gabe have been part of this club since its beginnings, and have been instrumental in making our club the great place that it is. WRAPUP: A total of over 50 MINIs from the Chicago MINI Motoring Club and the MilwaukeeMINIs invaded the Lake Geneva area. We explored a few twisty back roads, and had a great time despite the not so spring-like weather. Francis raised quite a bit of money in Tom’s name with the MINIs Motoring Against Cancer banner, and associated raffle. Huge thanks to Kevin, Dan, and Laurel from Knauz for opening up shop on an early Sunday morning and providing coffee and donuts to the caffeine and sugar deprived, Theresa from the MilwaukeeMINIs for teaming up with us, and to Dustin for planning the route and providing giveaways. Please forward a link to your pictures to steve@chicagominiclub.com, and I will add them here..
UPDATE 8/4/2008: At this point we are sold out of tickets!! We will have the Meetup details and time posted a little later. 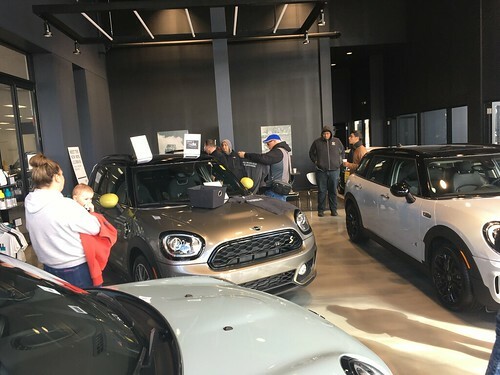 The Chicago MINI Motoring Club is teaming up with the Milwaukee MINIs for some tailgating and a baseball game in Milwaukee on Sunday September 28th.